Sir John Soane and John Flaxman were artists of European stature. In literature terms, William Godwin, Mary Wollstonecraft, John William Polidori are all key figures in their day. And there are many other stories to unravel too – Chevalier d’Eon, Paolo di Pasquale, Samuel Cooper. 1860s and 1880s railway works ran across much of the later burial ground, uprooting or smothering thousands of burials. Involvement of Thomas Hardy makes it all the more extraordinary. One of only 2 Grade I monuments – an extraordinary, idiosyncratic design from the key British architect of the Romantic epoch. Burdett-Coutts fountain embodies the zeal for improvement and the reinstatement of amenity, plus reverence for the memories of so many distinguished dead. 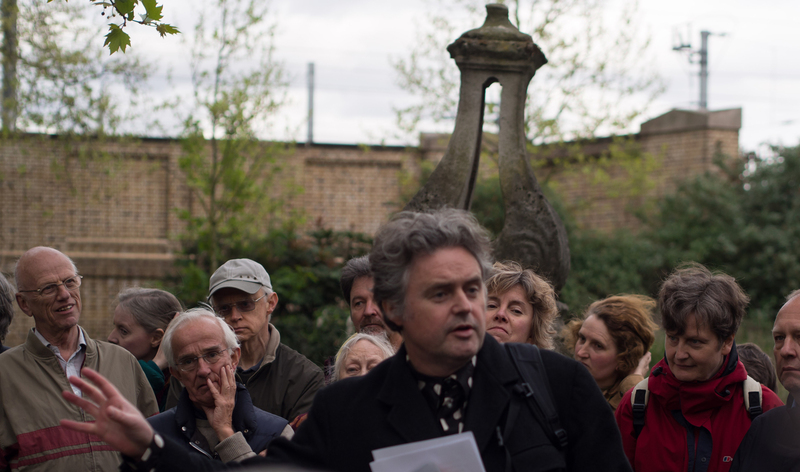 This was the ultimate fight-back, re-asserting the specialness of St Pancras Churchyard after 15 years of assault by the Midland Railway – and an early chapter in the history of conservation. Despite upheavals, the quantity and continuity of burial is striking and unprecedented. The tranquil above-ground scene is contrasted markedly by the seething below-ground scenes of burial, dramatically brought to C21 notice by a highly sophisticated archaeological investigation. Origins perhaps of Seventh Century foundation, and surely established by Anglo-Saxon times: one of the oldest sites of Christian worship in Camden, and one of the oldest religious sites in London. To pause and think of this, alongside the sleek Twenty-first Century international railway line, is to connect with deep time. Diversity, creativity, learning, upheaval: all aspects of Camden’s history are distilled here. One is reminded what a special situation it has – just to the north of the British Library, not far from the British Museum, UCL, Bloomsbury, etc. This is no ordinary part of London!